Underwater volcanic activity has pushed an previously unseen island to the surface in a remote part of the Red Sea. Fishermen witnessed spewing lava fountains reaching up to 90ft tall on December 19 near the group of islands known as the Zubair Group, off the west coast of Yemen. 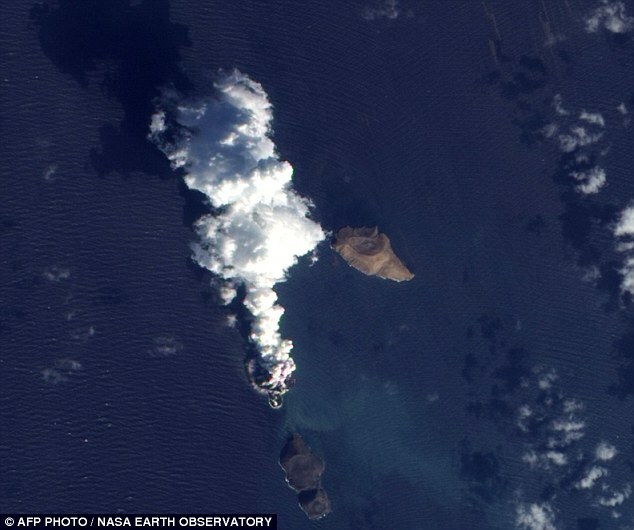 Days later images released by NASA Earth Observatory show the underwater explosion seems to have created a new island in between the Rugged and Haycock islands. Running in a roughly northwest-southeast line, the Zubair islands poke above the sea surface, rising from a shield volcano. 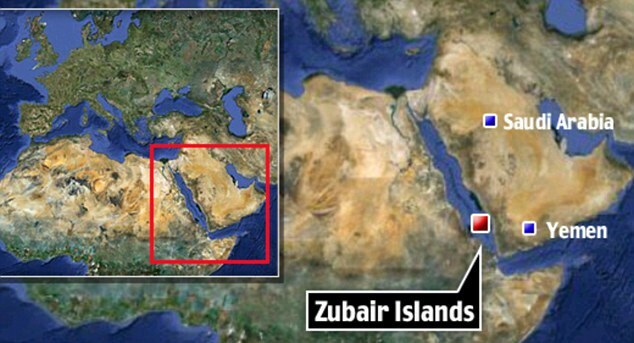 It is not yet clear how big or if the landmass created will be a permanent fixture of the Zubair Group of islands. A Nasa spokesman said: 'The Advanced Land Imager on NASA’s Earth Observing-1 satellite captured these high-resolution, natural-color images on December 23, 2011 , and October 24, 2007. 'The image from December 2011 shows an apparent island where there had previously been an unbroken water surface. According to the NASA Earth Observatory website, the existing ten islands poke above the sea surface, rising from a shield volcano. And as this region is part of the Red Sea Rift where the African and Arabian tectonic plates pull apart and new ocean crust regularly forms, eruptions are not thought to be unheard of but because of the remote location, they are rarely discovered. Nearby Jabal al-Tair volcanic island erupted unexpectedly in 2007, after 124 years of inactivity, killing 8 people, as well as the volcanoes of the Afar Triagle in Eritrea and Ethiopia and the volcanic fields of southern Yemen and Saudi Arabia. An underwater eruption in Magma created a new Canary Island in November. At just 70 metres from the surface the volcano and islanders are still trying to come up with a name for the new island. It is quite close to El Hierro and geologists feared if it continued to erupt it could eventually meet up with the mainland.